Growing up, my Mom was a master of decorating our house for any and every holiday, but she definitely earned her title of the "Halloween Queen". She has passed on her love for this holiday to all of her daughters, but I think my sister, Michelle from A Place For The Lady, pulls it off the best! 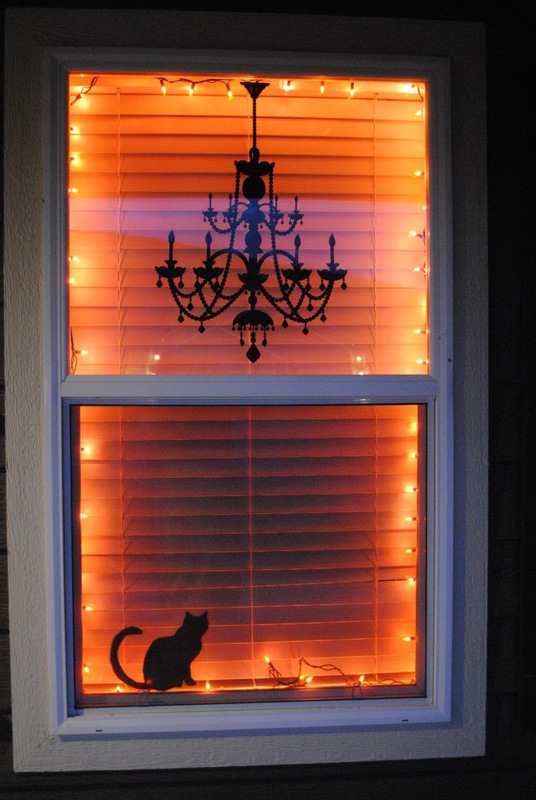 Check out her amazing Halloween decor! My favorite is her Pottery Barn countdown calendar knock off, it looks almost EXACTLY like the real thing, and she just eyeballed it! She amazes me with her talent and eye to decorate! She's here today to share some of her great ideas with us! Take it away Michelle! Welcome, foolish mortals! I'm here to give you a peek into our haunted house, and hopefully share some thrifty tips for making your house boo-tiful this time of year! This door sign I crafted digitally using Haunted by My Mind's Eye, and mounting it with Mod Podge on a wooden sign painted black I found at a local craft store. The mantle - a picture of last year's Halloween costumes, spooky lighted garland and candles, and a newly-made "Boo" sign out of vinyl lettering, backless frames and Halloween scrapbook paper. 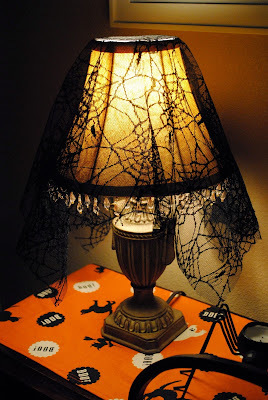 Oh, and some spiderweb fabric draped over the mirror. 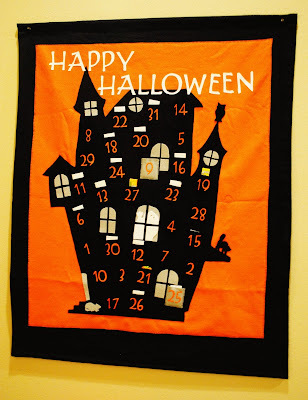 I fell in love with the Halloween countdown calendar from Pottery Barn last year and wanted to re-create it for cheap. It definitely turned out to be a labor of love, but the kids love it and so do I! 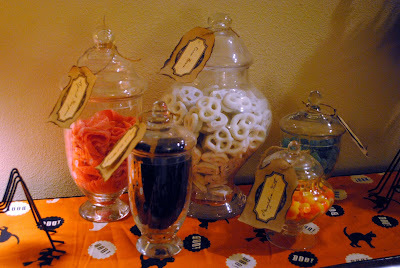 I loved House of Smiths' Halloween candy jars this year, so I did my own version! 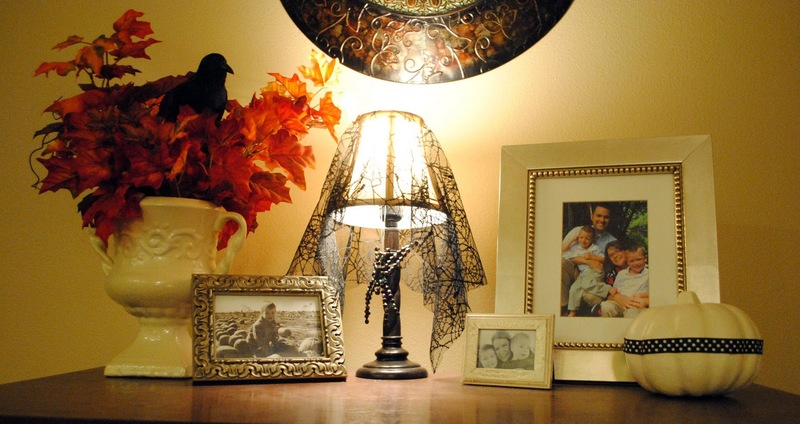 Almost all of my lamps have been draped in spooky spiderweb fabric. I love the effect. 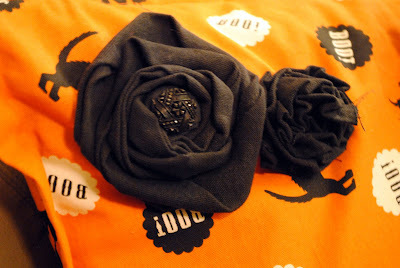 I made some more Halloween pillows this year...I couldn't pass up Targets cute placemats & tablecloths, so I butchered them and made covers for my pillows, and table runners for my piano and dining table! I fashioned some deadly black flowers out of fabric and attached them to the pillow cover. Gotta love the dollar store black crows - here's one perched in my fall foliage. You also gotta love the dollar store pumpkins...I spray painted mine off white and hot glued a fun ribbon around it. Every year we have what we call "Halloweekend" with my parents and sister's family in early October. 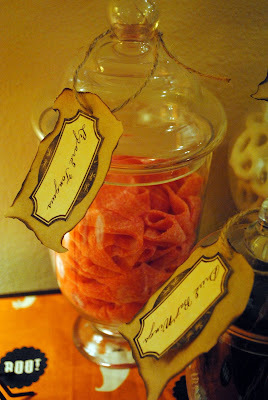 The girls do a Halloween craft as part of the fun...here's what we came up with this year, inspired by Li'l Luna. 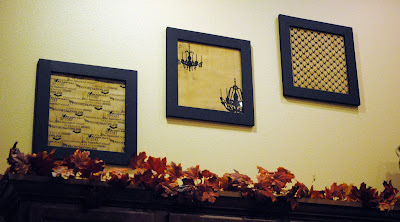 I change these frames above my cupboards seasonally...here is more of Haunted by My Mind's Eye. A shot of the dining room...runner made from Target tablecloth, black cake plate made from a black bowl and plate, dollar store pumpkin & moss, and Target creepy bird and tree decal. 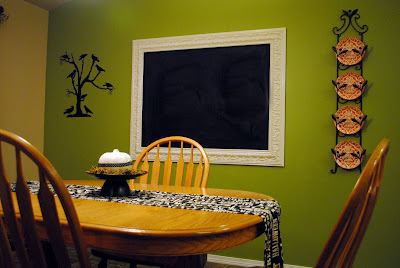 The magnetic chalkboard I made from a large piece of galvanized sheet metal (found at Home Depot), chalkboard paint, and framed out with decorative foam molding from Lowe's that I spray painted with Heirloom White by Rustoleum. Bo-Bo Bones guarding our home office! We made him a few years ago out of paper plates! Simple Pumpkin topiaries, and my old autumn wreath made over by wrapping a cheap autumn garland around the old one! The bats for the bat cave were created with stiffened black felt, but you could use black cardstock as well! Here is the template. I used a chandelier decal from Target and a black cat silhouette from Martha Stewart to create this spooky scene. 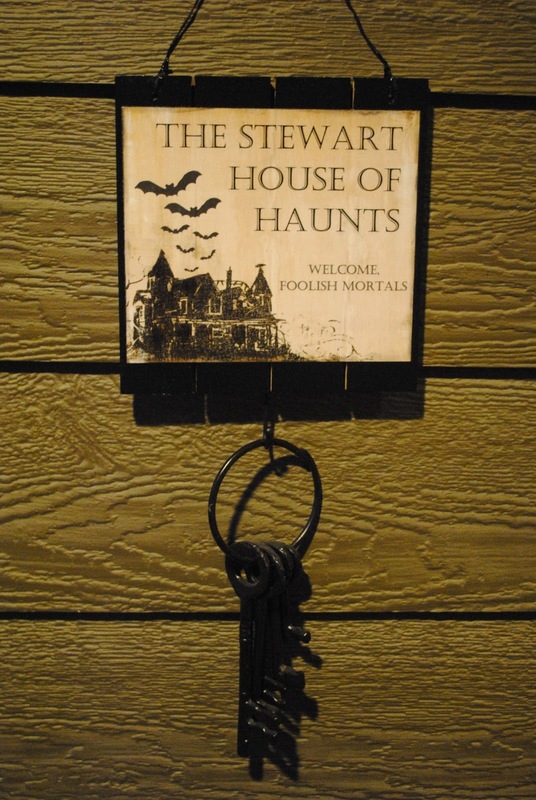 Thanks for visiting the Stewart House of Haunts! Until next year! I hope you all enjoyed getting a peek into the haunted house as much as I did! I wish I lived closer to my sister so she could come boo-tify my home! Thanks again for sharing with us Michelle! Don't forget to check out Michelle's site: A Place For The Lady! I love this.. I love all of the pictures! 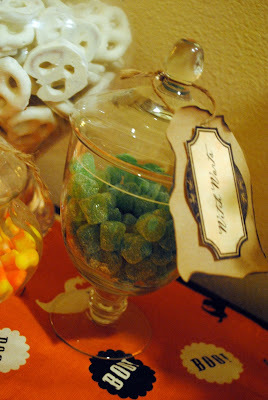 Love all your fun Halloween creations, and had tons of fun on "Halloweekend"! I have such creative daughters! I'm loving that cool window scene with the decals! Great job! Glad I found your blog. I am now your new follower.